located at a distance of about 6 km towards north of Kollam town. If the tourists give the due attention to this beach, it has potentiality to rival the Kovalam Beach Resort. At present, it is a perfect destination for budget tourists. 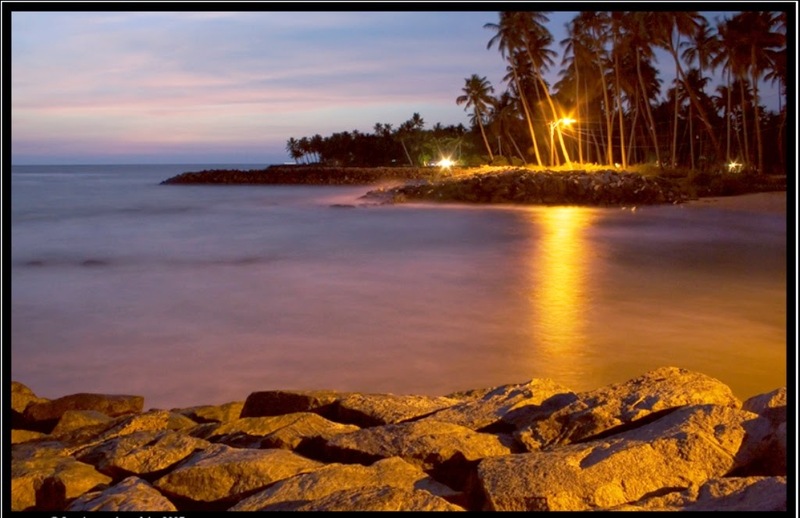 Thirumullavaram beach is also considered as on the three picnic spots in Kollam, the other two being Thangasseri and M.G Beach. The beach derives its name from the Maha Vishnu Swamy temple located close to this place where thousands of people gather annually to pray for the peaceful life after death of their dear departed ones, on the new full moon day in the month of Karkataka of the Malayalam calendar or between the months of July to August. This ritual that is held before this temple is called Karkadaka Vavu. Legends have it that the temple is one of the seven established temples by Parasuram, who raised Kerala from below the sea. The beach forms a shallow bay with a patch of sand dotted by rocks. The piles of intermittent rock are found all over the curvy shore. The Government had put these clusters of rock in order to preserve the shore from strong tides. Ever since the disastrous tsunami of 2005, rocky barriers have become an important feature of the coasts in Kerala. There is also a large pond close to the sea. The pond could be an extension of the sea, if it was not bordered by the strong wall and tiny strip of land in between. An interesting part of this pond is that the number of people seen swimming in its waters are much larger than the ones seen swimming in the sea waters. There is also a large rock that projects from the sea, at a distance of about 2 kilometers from the shore of the beach. It is called Sunday Rock and is visible during the low tides from the shore of the beach. During the low tides, the waters of the shallow beach bay are perfect for swimming. Though, it is advisable to avoid it during the high tides. During the low tides even the children can enjoy a swim in the waters of this beach. It is a local beach which can be visited for a couple of hours of relaxation and enjoyment. There are also places where they teach yoga, at a close distance from this beach. There are Ayurvedic centers also, that provide luxurious and rejuvenating therapies and massages. The beach is certainly a perfect place to chill out in weekends. There are very few options for accommodation at this beach. If you are searching for some comfortable and luxurious place to stay then you should opt for the ones in Kollam town. The best time to visit this beach is from October to March. By Road: The beach is easily accessible through road from Kollam town. Bus services are available to this beach from the town. By Air: The nearest airport to this beach is Thiruvananthapuram International and Domestic Airport, which is located at a distance of about 70 km. By Rail: The nearest railway station to this beach is Kollam Junction, which is the main station of the town, located at a distance of about 6 km.